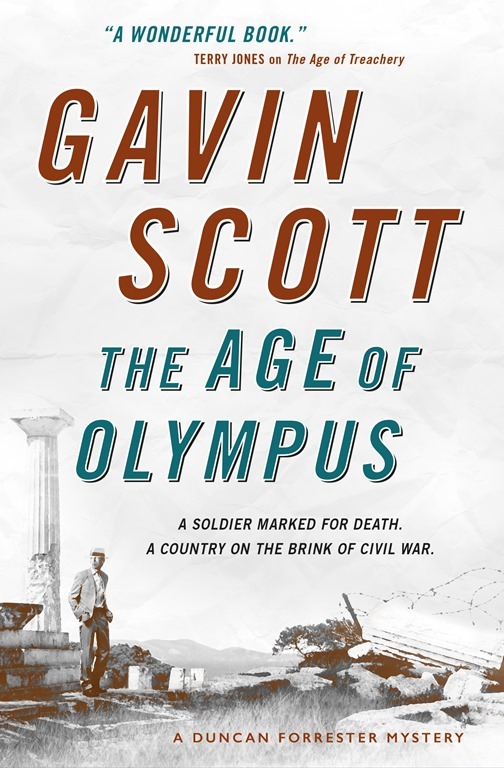 The first character to speak in The Age of Olympus is Osbert Lancaster, who was, in real life the press attaché to the British Embassy in Athens in 1946 when the events of the novel take place. I am a great fan of Osbert Lancaster, and have been since before I knew who he was. This was because of a book published in 1948 that I came across in the home of my best friend, Conrad Pharazyn, in Havelock North, New Zealand, in 1962. 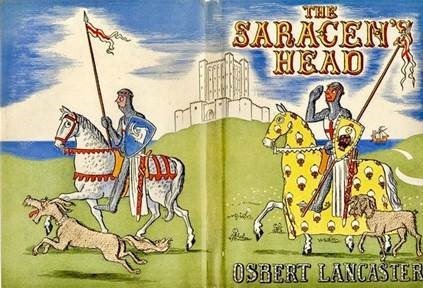 It told the story of William de Littlehampton, who was guilt-tripped by his mother into going on Crusade (that’s him leaving in the picture on the left) and came back a hero (there he is on the front cover) and I found it was very, very funny. 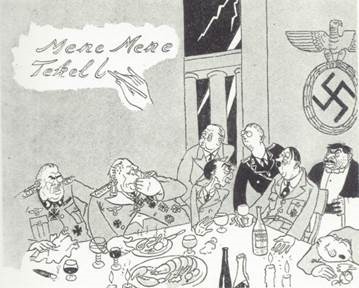 This is the somewhat bloodthirsty and quite politically incorrect drawing I loved best. Osbert was born in 1908, (looking rather less fierce, one hopes, than he does in this picture) during that golden Edwardian era before World War One, and went the famous Charterhouse school, whose headmaster kindly described him as “irretrievably gauche” and “a sad disappointment.” But at Oxford his friends included such future luminaries as Beverly Nichols, Cecil Day-Lewis, Cyril Connolly, Evelyn Waugh, Harold Acton, Randolph Churchill and John Betjeman. Whether despite or because of this galaxy of soon to be famous friends, he graduated with a fourth class degree, but found his true métier (and his wife, Karen) when studying drawing and design at the Slade School of Art. 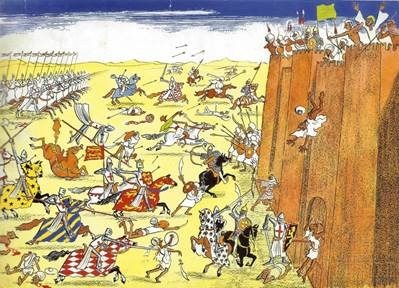 He then began a prolific career as an illustrator of other people’s books, a writer and illustrator of his own, a stage designer and a cartoonist for the Daily Express for which he drew over 10,000 cartoons, which gave the British people great cheer during the war. 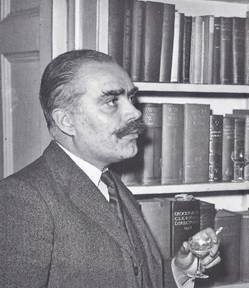 Osbert appears in The Age of Olympus when the Foreign Office sent him to Athens as a press attaché in 1946, where he claimed to have saved the life of Winston Churchill from a communist sniper in the garden of the British Embassy. 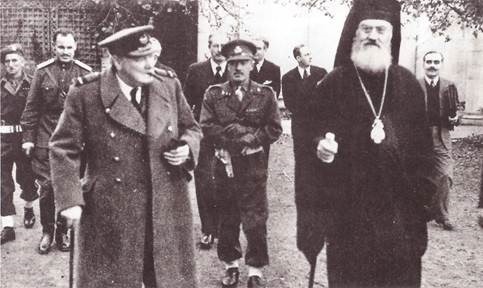 In the picture below, which I think was taken in that very garden, Osbert is the natty-looking character on the far right, looking quizzically at the gigantic figure of Archbishop Damaskinos, the regent of Greece, who also features in the story, together with his silver-topped cane. 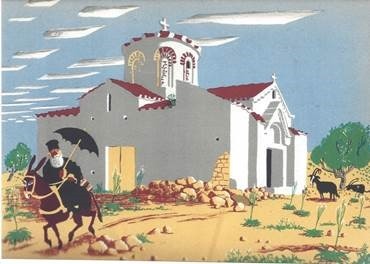 In fact it’s through Osbert that Duncan Forrester and Sophie meet the Archbishop and most of the other characters who are to play a role in the drama, and for my depiction of life in Athens at the time, I drew heavily on his wonderful description of Greece in 1946, Classical Landscape With Figures. 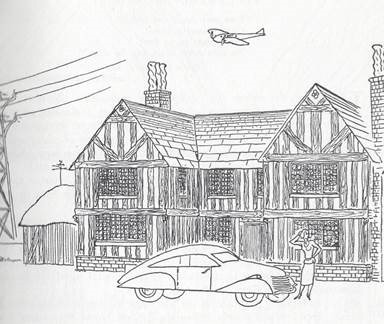 His friendship with John Betjemen and their mutual delight in traditional English architecture and contempt for most contemporary buildings resulted in a series of magnificently witty books in which Osbert not only drew beautifully clear pictures of every imaginable architectural style, but gave them magnificent names which have tended to stick – such as Wimbledon Transitional and Stockbroker’s Tudor. To say nothing of Carpenter’s Gothic. 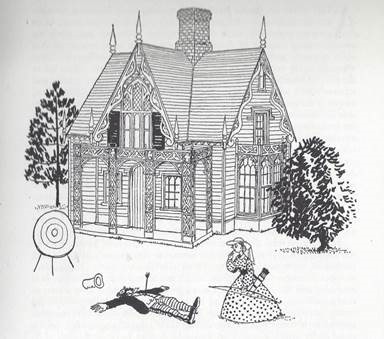 You can find them in a series of books on architecture, culminating in the highly illuminating Cartoon History of same. Then there is his work for the stage, and for the Festival of Britain, and two delightful volumes of autobiography, All Done From Memory (1963) and With an Eye to the Future (1967). 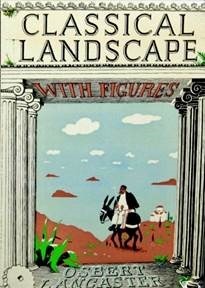 He was knighted in 1975, one of the few cartoonists ever to receive the honour, and died in 1986 at 77 in Chelsea. His obituary in the Times said he was "The most polite and unsplenetic of cartoonists, he was never a crusader, remaining always a witty, civilized critic with a profound understanding of the vagaries of human nature." 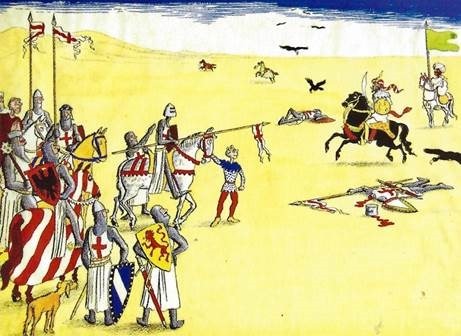 But I will always remember him for the wonderfully bloodthirsty drawings in The Saracen’s Head, and the pleasure they gave me as I sat in the shade of the Pharazyn’s porch below the Havelock Hills when I was twelve years old. And of course, as well as Osbert himself, there’s a crusader in my book, too.